Jennifer Huggins, Fight To End Cancer’s Founder & Executive Director, has been announced today as one of the 8 Ambassadors of the International Boxing Association’s (AIBA) Women’s World Championships, which will be taking place in Astana, Kazakhstan; from May 19 – 27, 2016. This is an extremely prestigious opportunity for Jennifer and we here at Fight To End Cancer are very proud of her for this incredible accomplishment. Congratulations Jennifer! We look forward to following you on this exciting journey and seeing all of the great experiences that you are sure to have! See below for the official press release from AIBA International Boxing Association. 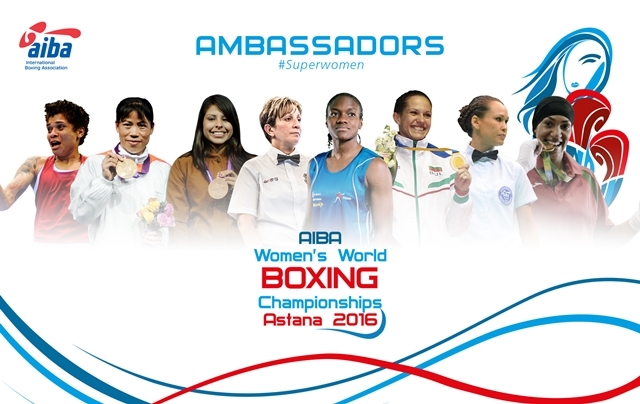 AIBA is proud to announce its women boxers and R&J ambassadors for the eagerly anticipated event, the 2016 Women’s World Championships in Astana, Kazakhstan. From 19-27 May, the Kazakhstan capital of Astana will host more than 300 of the world’s top female boxers for another thrilling edition of the AIBA Women’s World Championships. With ten gold medals at stake, this year’s tournament also has twelve Rio 2016 quota places available and offers one last glimpse at who could become Olympic legends. AIBA has appointed eight ambassadors for the event, influential figures from inside the ring who embody the spirit of our sport. Representing the boxers are Nicola Adams of Great Britain, Team USA’s light flyweight Marlen Esparza, MC Mary Kom of India, Adriana Arauja from host country of this year’s Olympic Games Brazil, Bulgaria’s Stanimira Petrova and Morocco’s Khadija Mardi, while the female officials are Algerian Kheira Siki Yakoub and Canada’s Jennifer Huggins. MC Mary Kom’s remarkable journey to winning five world flyweight titles has been the subject of a major biopic film, and Marlen Esparza had a CNN documentary filmed about her rise to becoming an Olympic bronze medallist in London. With Nicola Adams receiving an honorary degree from Leeds University, it is clear that the ambassadors have been selected for more than just their abilities in the ring, but for their position as positive role models for aspiring boxers and women in general. “The World Championships are the perfect showcase for our sport and the tournament has scaled massively with the field getting stronger at every edition. AIBA is really pushing the women’s side of boxing and it fills me with great pride to be an ambassador for this year’s competition. I’m going into the competition fully focussed on winning Gold, which would be an incredible achievement and ideal preparation for Rio,” said flyweight Nicola Adams. Stanimira Petrova became the first female world champion from Bulgaria in Jeju in 2014. The Bulgarian flyweight boxer reached world class level very quickly and demonstrated she is one to watch in the coming years. Brazilian Adriana Araujo, who won the bronze medal in London 2012 is one of the best Olympic 2016 host country women’s representative and the lightweight boxer will have all the support of her home crowd for the August competition. North African middleweight boxer Khadija Mardi, along with AIBA’s first five star female R&J Kheira Siki Yakoub, have given the Arab world two superb female icons in boxing and between them have been responsible for a huge surge in popularity of women’s boxing in the region, and Jennifer Huggins’ endless enthusiasm for the sport she loves and associated charity work makes her a hugely valuable member of the team. “I am grateful and overjoyed at all of the opportunities I have been presented with AIBA. I am honored to be part of the ambassadors program, to represent AIBA R&Js and to contribute to the promotion of women in boxing”, said Jennifer Huggins.